A kitchen island is a great addition to get more cook prep area and storage space without having to remodel your kitchen with new countertops or cabinets. You expand the functionality of the space without having to do major work or spending huge amounts of money. If the island is on wheels, you can enjoy the flexibility of easily moving the island wherever you need it the most for your cooking prep. A kitchen island can take a beating. You do a lot of cutting, slicing, chopping and beating on the surface, and the materials have to be of the highest quality if they are going to hold up over time. 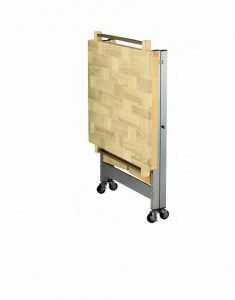 The fold-away kitchen island cart features the best quality wood and stainless steel to stand up to whatever you can throw at it. These materials are durable and stylish, ensuring that the cart provides the functionality you need for many years to come. You don’t have to worry about the cart rusting, splitting or experiencing other common damage. The stainless steel supports also ensure that you can work without worrying about the cart falling over. You will have a sturdy work area that offers up to 8 square feet more space to your kitchen. The space-saving kitchen island cart may not include cabinets or drawers, but it has other features that allow for plenty of storage. 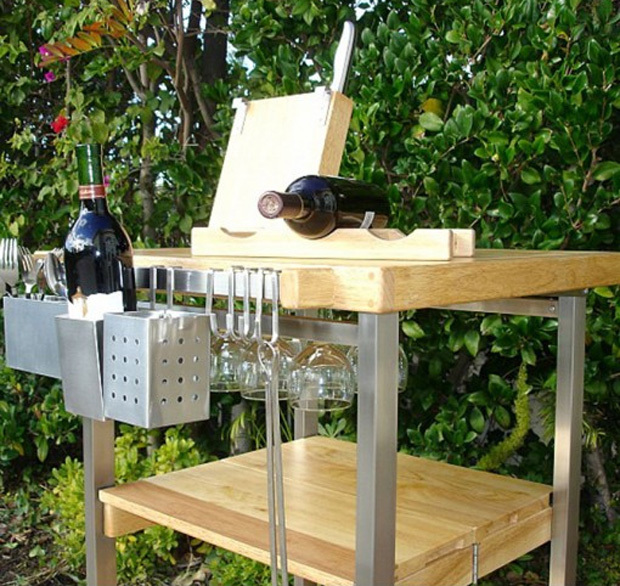 Under the surface top is a stemware rack that allows you to hang wine glasses and more to keep them handy. There are also hanger hooks around the cart that allow you to store pots, pans, oven mitts, pot holders, utensils and more. The two lower shelves also give you an area to store extra dinner plates, mugs, produce and more. You can stock up what you need for an individual meal’s prep, or you can keep extra dinnerware and other items nearby during a dinner party. Many kitchen islands are massive things that sit stolidly in the middle of your floor space. It’s hard to move them, and if you can get them out of the way, they will still be too large to get out of your kitchen completely. 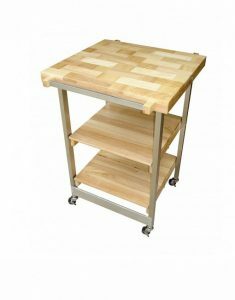 This fold-away kitchen island cart is small and lightweight, so it can easily be moved to anywhere in your kitchen and anywhere in your home. An extra great feature of this cart is that it can be folded up and put away completely. The cart folds flat without having to unscrew anything or take anything apart. You just fold it up and wheel it into a closet or even under a bed. The whole thing won’t take up more than a few inches of depth (or width, depending on which way you store it). 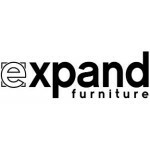 Expand Furniture has several other wonderful options for space-saving kitchen island carts. These carts have different designs and aesthetics, but they are all made of high-quality materials and have a design that will fit right in with your modern aesthetic. 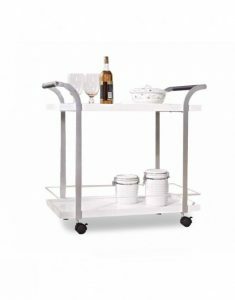 The multi-height serving cart is perfect for serving guests. You can put a drink service and some snacks on the multiple tiers and store an ice bucket or other necessities on the bottom. Stainless steel guard rails provide protection so that bottles and glasses don’t fall off. 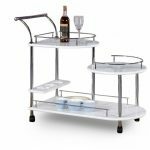 The motion trolley serving cart provides a serving tier and a storage tier, and it offers more flexibility for drink and food service. The mobility means that you can serve guests anywhere in your home, including on your back patio or porch if you are having a cookout. 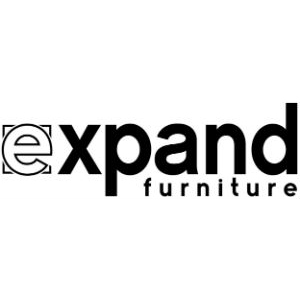 Expand Furniture offers all types of space-saving furniture options for your kitchen and the rest of the rooms in your home. 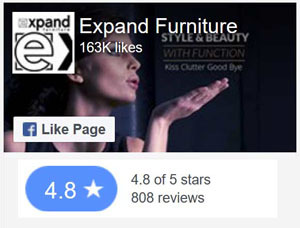 We sell everything from transforming coffee tables to Murphy wall beds, helping you to make more out of the space you have, no matter how large or small your home. 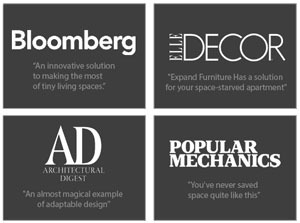 Explore our online catalog to find the perfect space-saving kitchen island cart or other high-quality space-saving furniture that meets your needs. Heating up your Kitchen with innovative space savers Transform Your Kitchen this Summer with These Top Space-Saving Items Style and Practicality: Modern Coffee and End Tables Top Rated Dining Sets to Optimize Your Kitchen Space Top Space-Maximizing Hacks to Try Now!